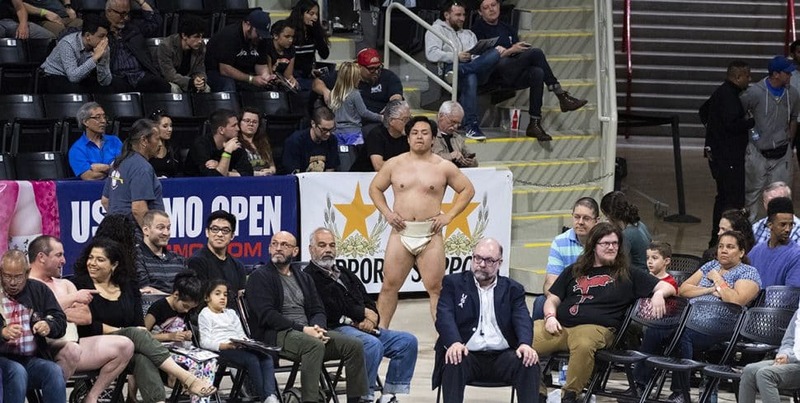 Trent Sabo, right of Idaho, can't take down, Japan's Hiroki Sumi, left, during the open round at the 19th Annual US Sumo Open at the Walter Pyramid in Long Beach Saturday, March 23, 2019. Photo by Thomas R Cordova. Here’s a bit of what was seen. A full house at the 19th Annual US Sumo Open at the Walter Pyramid in Long Beach. Photo by Thomas R Cordova. 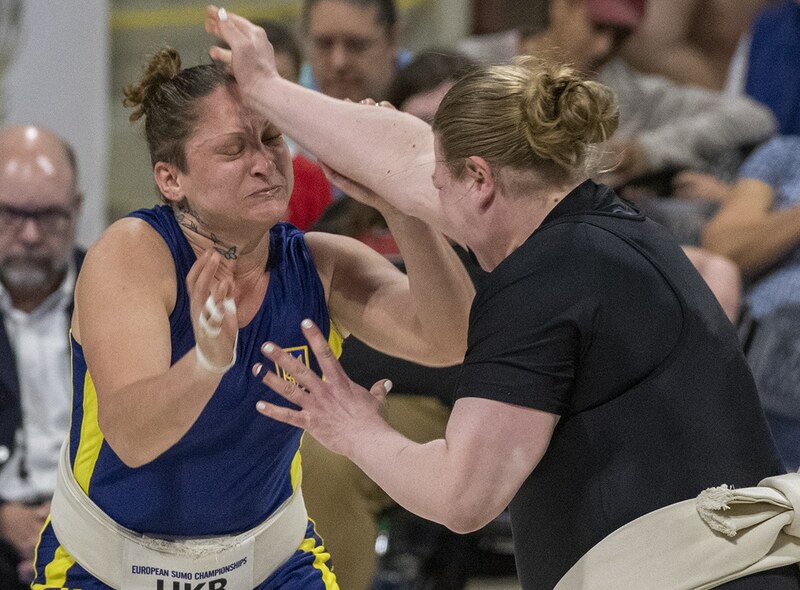 Julia Dorny, left of Germany, pushes out Danna Engelberg, of California, during the Women’s Open Division during the 19th Annual US Sumo Open at the Walter Pyramid in Long Beach Saturday, March 23, 2019. Photo by Thomas R Cordova. Nyambayar Lkhanna, left, of Mongolia, throws out Hilmar Widerberg, right, of Norway. Photo by Thomas R Cordova. Maryna Maksymenko, left of Ukraine, battles . Thomas R Cordova. 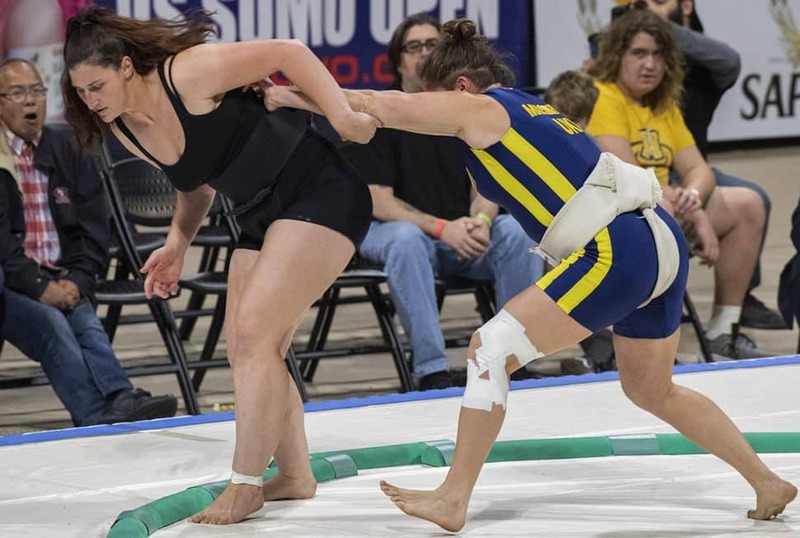 Maryna Maksymenko, right of Ukraine, pushes out Mariah Holmes, left of Riverside, during the 19th Annual US Sumo Open. Photo by Thomas R Cordova. Julia Dorny, left of Germany, battles Mariah Holmes, right of Riverside, during the 19th Annual US Sumo Open at the Walter Pyramid. Photo by Thomas R Cordova. 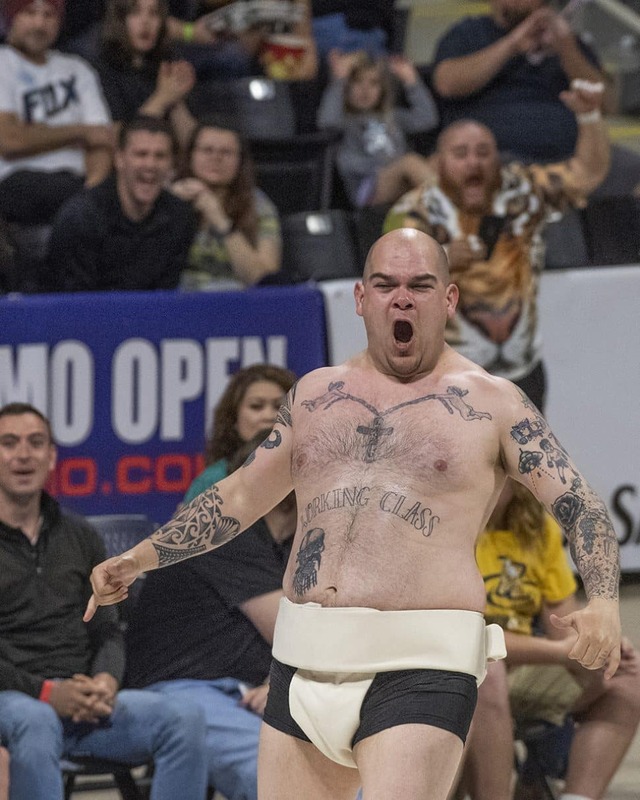 A tattoo on the hip of a sumo wrestler at the 19th Annual US Sumo Open. Photo by Thomas R Cordova. Nyambayar Lkhanaa, top, of Mongolia, tries to throw Anton Chuiev of Ukraine. Photo by Thomas R Cordova. 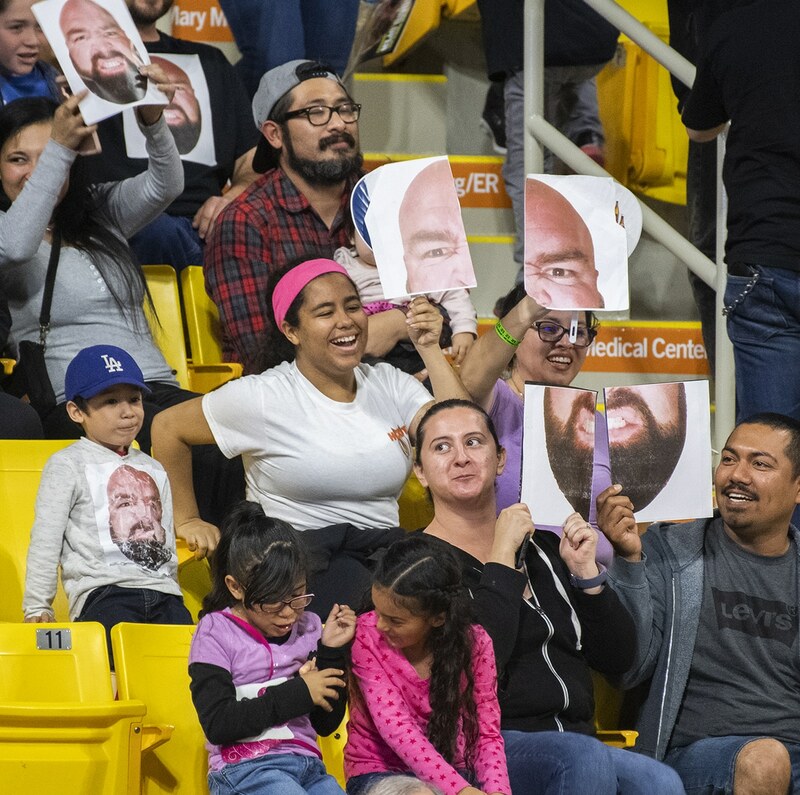 Friends, family and supporters cheer for Long Beach’s Oscar Vasquez at the 19th Annual US Sumo Open.Photo by Thomas R Cordova. 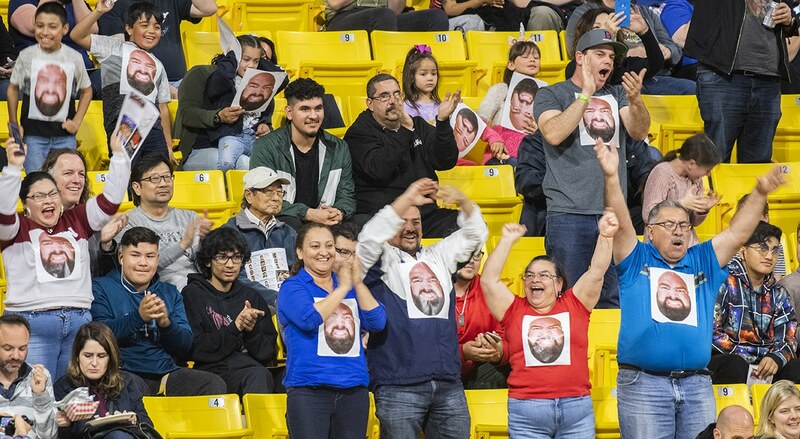 Friends, family and supporters cheer for Long Beach’s Oscar Vasquez at the 19th Annual US Sumo Open Photo by Thomas R Cordova. Long Beach’s Oscar Vasquez, right, gets pushed out by Kamal Basira of Egypt. Photo by Thomas R Cordova. Byambajav Ulambayar, right, of Mongolia, attempts to lift Kelly Gneiting of New Mexico. Photo by Thomas R Cordova. 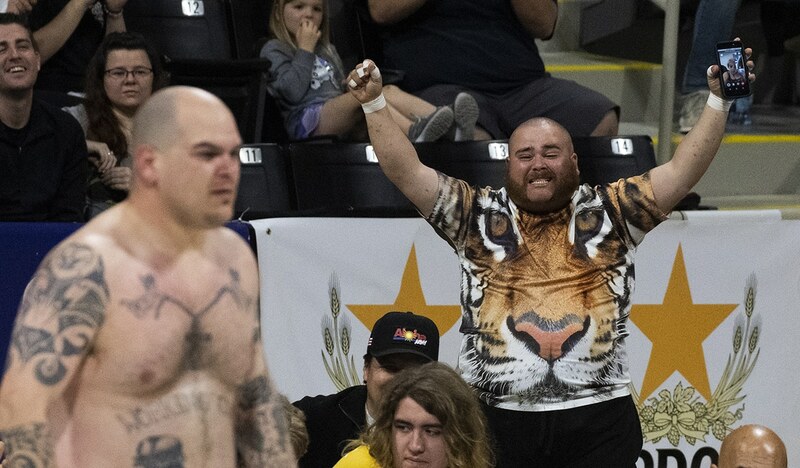 A fan reacts as the heavyweights make their way to the ring. Photo by Thomas R Cordova. 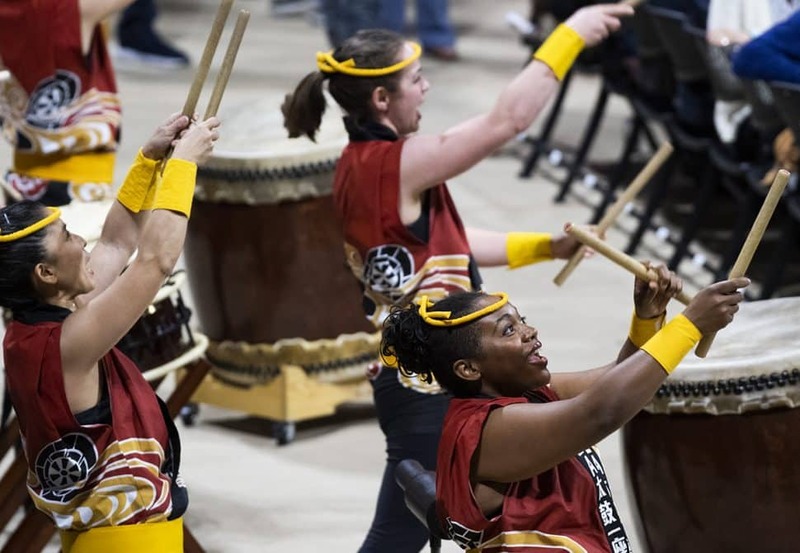 Taiko drummers perform at the 19th Annual US Sumo Open at the Walter Pyramid in Long Beach. Photo by Thomas R Cordova. 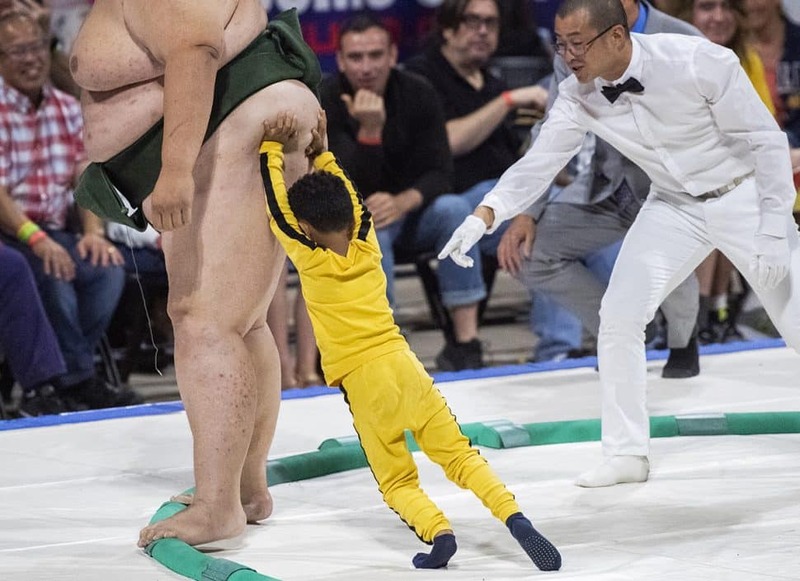 A small fan gets the chance to push out Yamamotoyama Ryūta. Photo by Thomas R Cordova. The 19th Annual US Sumo Open at the Walter Pyramid in Long Beach Saturday, March 23, 2019. Photo by Thomas R Cordova. Sviatoslav Semykras, right, of Ukraine, battles his countrymen Anatolii Khliustin. Photo by Thomas R Cordova. Sviatoslav Semykras, top, of Ukraine, takes down his countrymen Anatolii Khliustin. Photo by Thomas R Cordova. 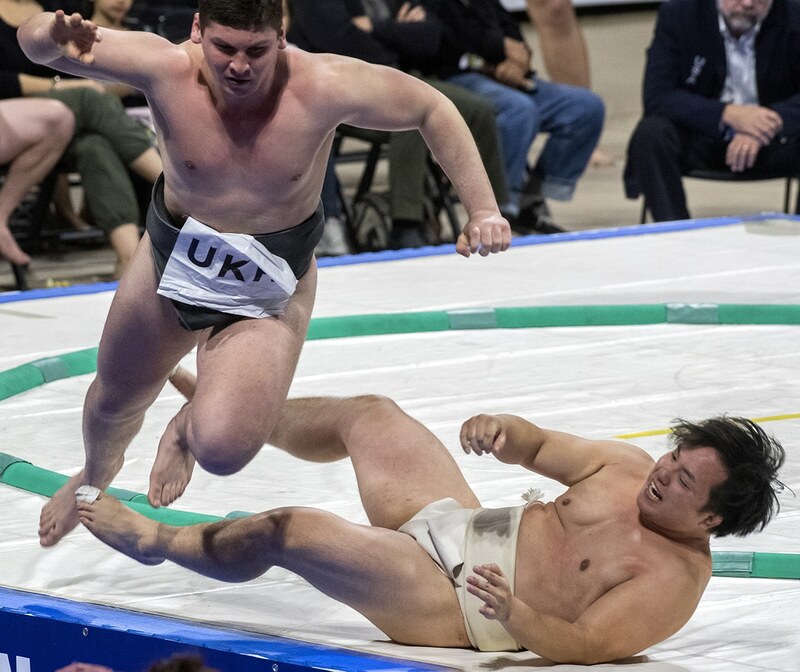 Sviatoslav Semykras, left, of Ukraine, drives his countrymen Demid Karachenko out of the ring to win the Men’s Lightweight title at the 19th Annual US Sumo Open. Photo by Thomas R Cordova. Sviatoslav Semykras, left, of Ukraine, drives his countrymen Demid Karachenko out of the ring to win the Men’s Lightweight title. Photo by Thomas R Cordova. 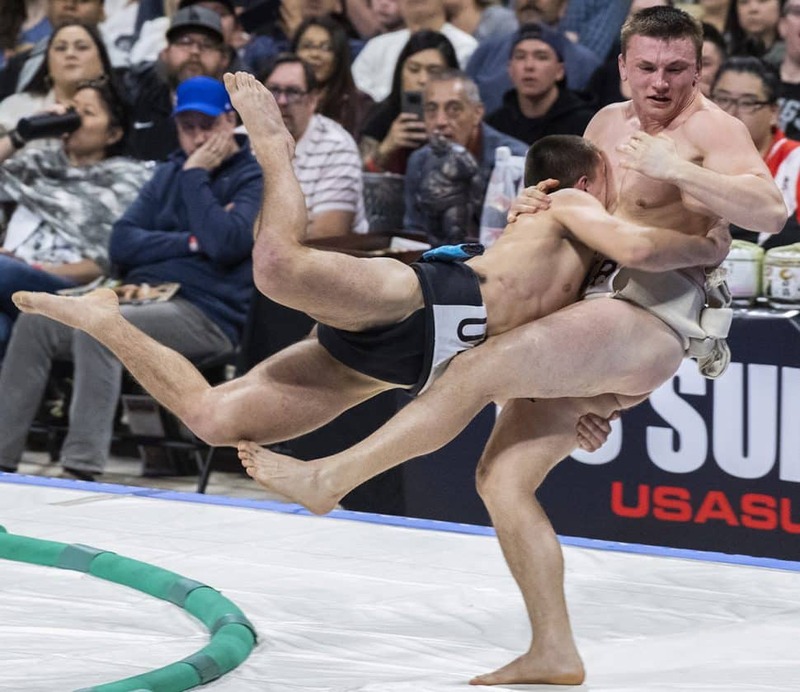 Sviatoslav Semykras, left, of Ukraine, drives out his countrymen Demid Karachenko, right, out of the ring to win the Men’s Lightweight at the 19th Annual US Sumo Open at the Walter Pyramid in Long Beach Saturday, March 23, 2019. Photo by Thomas R Cordova. 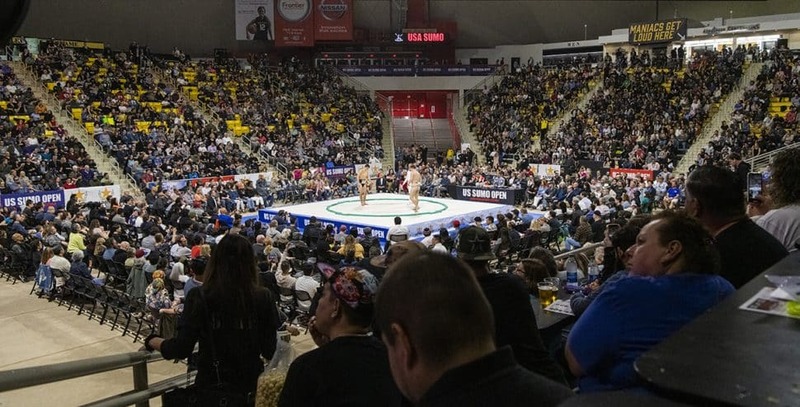 TTrent Sabo, right, of Idaho, hits the mat as he’s taken out by Mongolia’s Nyambayar Lkhanaa. Photo by Thomas R Cordova. Takeshi Amitani of Japan, celebrates his win as the Men’s Middleweight champion. Photo by Thomas R Cordova. Vazha Daiauri, left, of Ukraine, battles in the men’s open round during the 19th Annual US Sumo Open. Photo by Thomas R Cordova. Vazha Daiaurii, right ,of Ukraine, battles in the men’s open round. Photo by Thomas R Cordova. 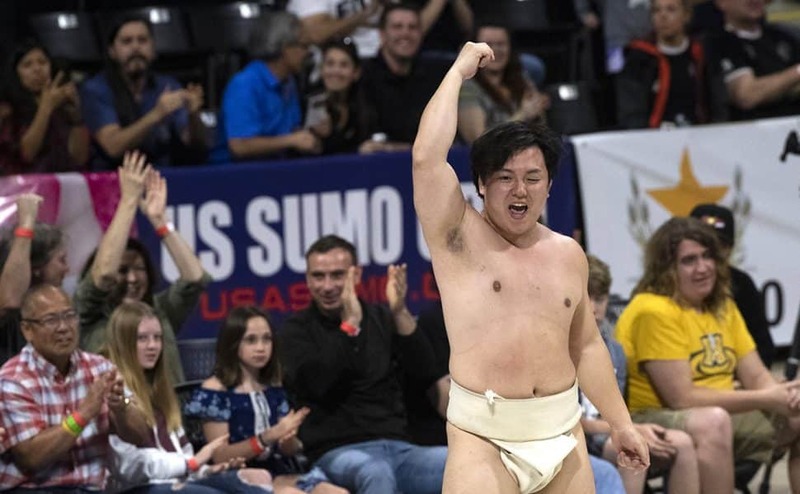 Timothy Perales of Washington, celebrates his match at the 19th Annual US Sumo Open.Photo by Thomas R Cordova. Timothy Perales of Washington, gets support after a match win. Photo by Thomas R Cordova. 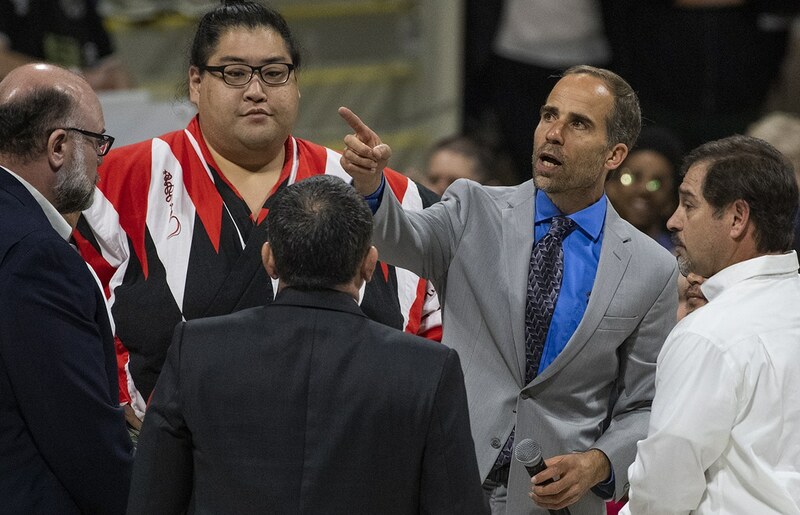 Andrew Freund, right, Director of US Sumo Open, gathers with the judges to discuss a call during the 19th Annual US Sumo Open. Photo by Thomas R Cordova. 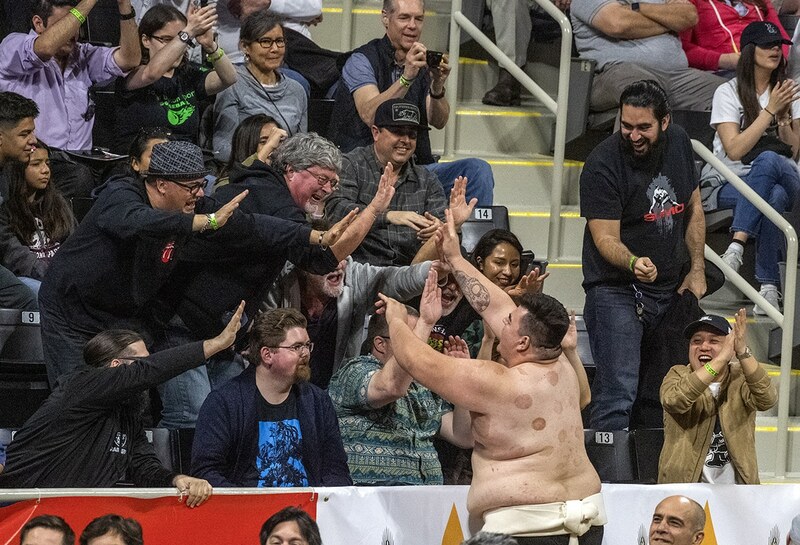 Jose Galindo of California, high-fives fans after a win at the 19th Annual US Sumo Open.Photo by Thomas R Cordova. Ramy Elgazar, left, of Egypt, reacts after losing to Japan’s Hiroki Sumi. Elgazar battles at 499 pounds and Sumi at 481 pounds, making them the two biggest men this year at the Open. Photo by Thomas R Cordova. 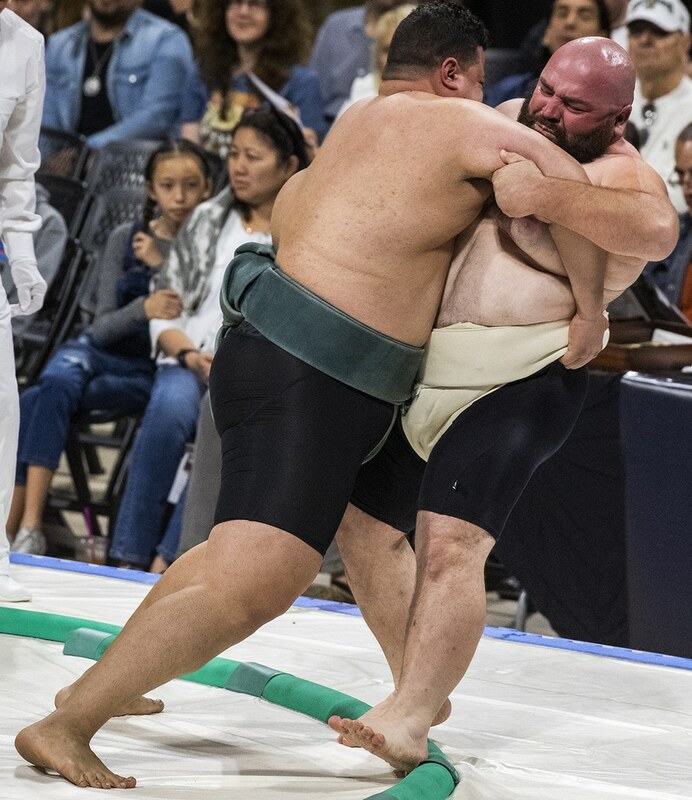 Trent Sabo, right, of Idaho, can’t take down, Japan’s Hiroki Sumi, left, during the open round at the 19th Annual US Sumo Open. Photo by Thomas R Cordova. 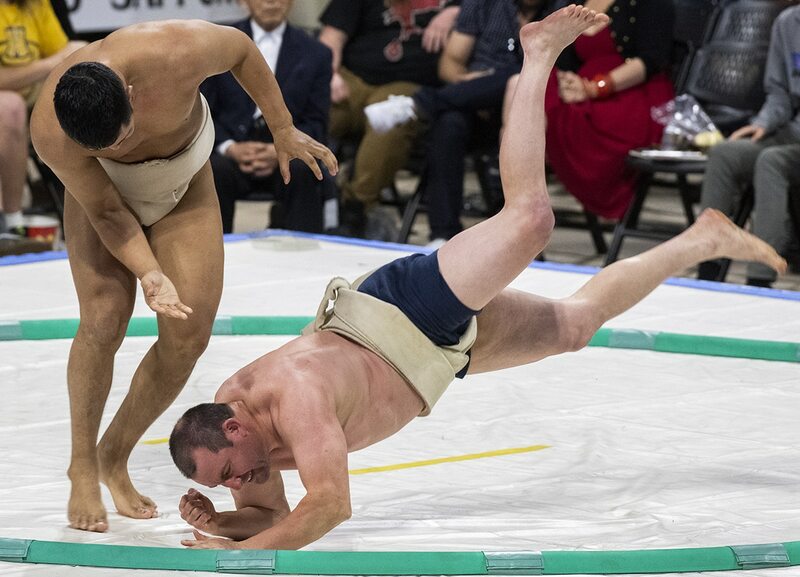 Japan’s Hiroki Sumi, top, takes down Norway’s Joakim Ruzvik, during the open round at the 19th Annual US Sumo Open. Photo by Thomas R Cordova. Vazha Daiaurii, right, of Ukraine, at 245 pounds reacts as he defeats Japan’s Hiroki Sumi, at 481 pounds during the open round. Photo by Thomas R Cordova. Takeshi Amitani. Photo by Thomas R Cordova. Takeshi Amitani of Japan, gets pushed out by Vazha Daiauri of Ukraine. Photo by Thomas R Cordova. 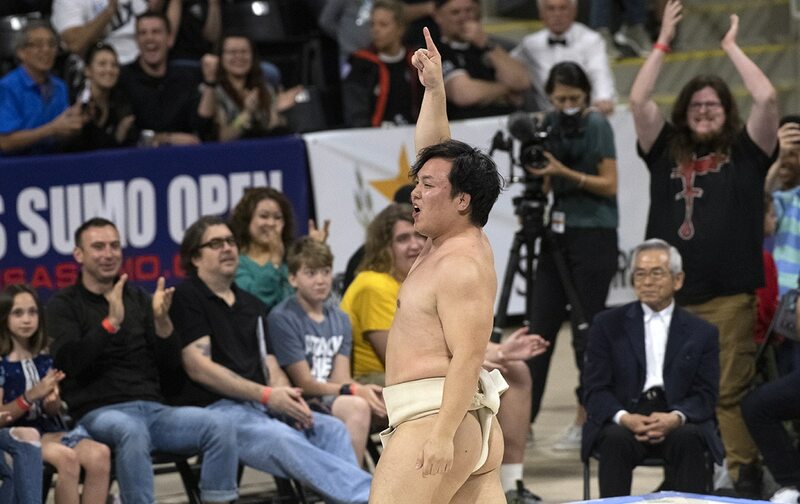 Two sumo wrestlers go overhand for the final match of the open round at the 19th Annual US Sumo Open at the Walter Pyramid in Long Beach Saturday, March 23, 2019. Photo by Thomas R Cordova.